Read all of my posts here. Let me start by thanking my dear, sweet, incredible husband for writing not one, but two posts on his own fertility ordeal. Weren’t they great? Ok, I know some of you have been waiting for this announcement and I’m sorry for all the hints lately. It’s so hard for me to keep such a big secret, but I’m glad to finally be writing about it! We’re pregnant! I’m nine weeks along and everything is going very well so far. We got to see the heartbeat two weeks ago, which also happened to be my first day of school. It was incredible and I cannot wait for my next appointment. I’m not sure if I can make it three more weeks, though! I have had a bit of sickness (not typically in the morning), but nothing crazy. I haven’t thrown up at all and usually I can make it go away by simply eating. I feel lucky that I don’t constantly have my head over the toilet and that I can eat more than saltines. However, some days I don’t feel sick at all, and that worries me because I know that symptoms mean things are moving in the right direction. I try to stay positive, but it is really hard with the year I’ve had. Want to know how it all went down? Well, I took clomid for the second time and we took a little trip to Big Sur and San Francisco. I’m pretty sure we conceived while camping (tmi? ), which I think is pretty cool. I didn’t test until the day after my missed period because I know how crazy early testing can make me. I called my doctor that day when I got a positive digital and they made an appointment for me to come in two days later. I was nervous that I wouldn’t get a positive there and that I’d have another chemical pregnancy or early miscarriage. Remember what I wrote about my new doctor? He’s great. The nurse said they didn’t even need to do a urine test because the doctor would do an exam and would be able to tell by the size and shape of my uterus if I was indeed pregnant. I was, and then we discussed progesterone suppositories. I told him that my (our actually, my husband felt the same way) inclination was to go without them. My doctor didn’t think they were necessary at all, so that was that. I left with paperwork for some blood tests to ensure that my hCG levels were increasing at the correct rate and was cautiously optimistic. Every blood test came back with great results and we got to go in for an early ultrasound at just 5 weeks. 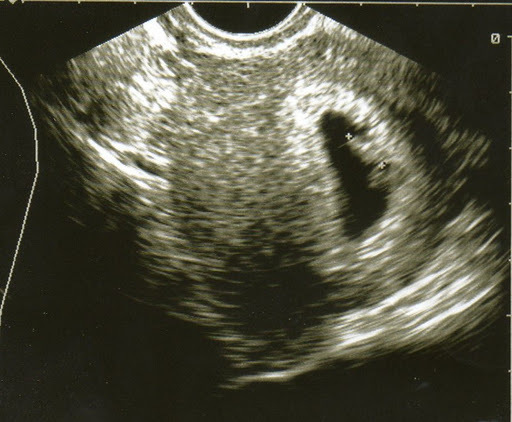 All we saw was a blob, no heartbeat as is was too early, and we scheduled another one for about a week and a half later. Yay! A heartbeat! And a more shapely blob! I said it looked like a sour patch kid. Maybe that was a craving talking? I know how lucky we are. Many couples struggle for several years and go through much more invasive treatments before finally being blessed with a child. It only took about 14 months and two rounds of clomid for us. Thank goodness, because I’m not sure I could handle or afford much more. I have a couple of posts that I wrote over the last five weeks to share with you guys and I’m going to start taking bump pics this week. I’m excited to share this journey with you all!! YAY SOOO excited for you guys!!! I am thrilled that this is finally working out for you, and I can't wait to read all about your pregnancy/mommy journey!!! I am so thrilled for you, words cannot express. I can't wait to read about your journey. We love you and Mike (and baby bean) so much! Congratulations!! HORRAYY!!!! I'm so excited for you! It's been a long road (and now there's apparently an even-longer one in front of you what with the baby and all:) ), and I'm so glad you got to your first destination! Congratulations!! I've had relatively mild symptoms myself, and am 14 weeks along with no apparent issues. Strong little heartbeat every time we check! Best wishes for continued success with the pregnancy, and remember to be calm and take all advice (especially from folks who aren't your doctor!) with a few grains of salt. CONGRATULATIONS!!! I'm looking forward to seeing the journey. fabulous news! take care of yourself and little one. so much fun! Amy this is wonderful new, congratulations!!!!! I've been following your posts and have enjoyed reading them and identifying with your story, but this post, yes this one is my favorite! Congratulations! I am SO happy for you!! congratulations!! Congratulations! Such great news- so happy for you! MANY congrats! Lucky to have been one of the first people to see you post-conception! (OK, that's TOTALLY TMI) :)YAY!!! Congrats!!! Very happy for you and the hubby. His posts were hilarious, btw! I am soooo happy for you, Amy! I don't think I've ever been this happy that someone was preggo! You're going to be fantastic parents!